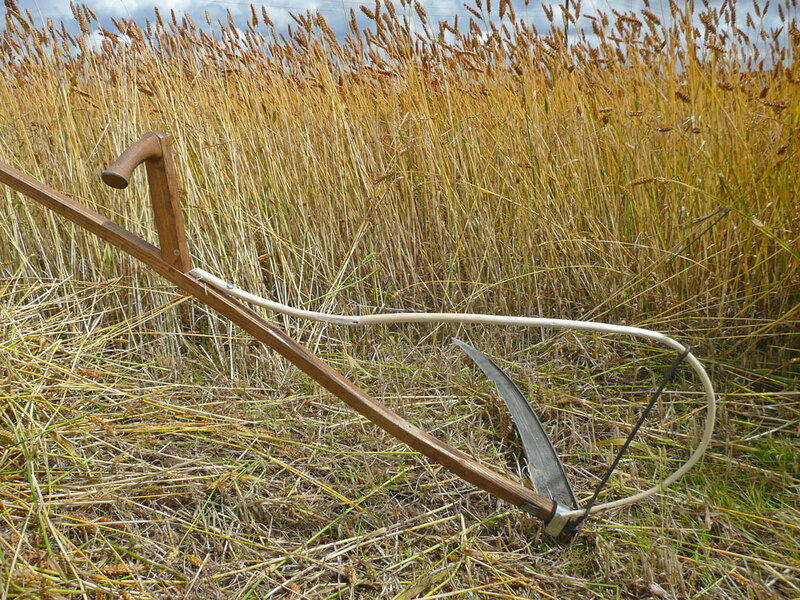 To mow tall crops such as thatching wheat or Norfolk reed with a scythe you need to fit a cradle to hold the straw from falling back over the snath as you mow. 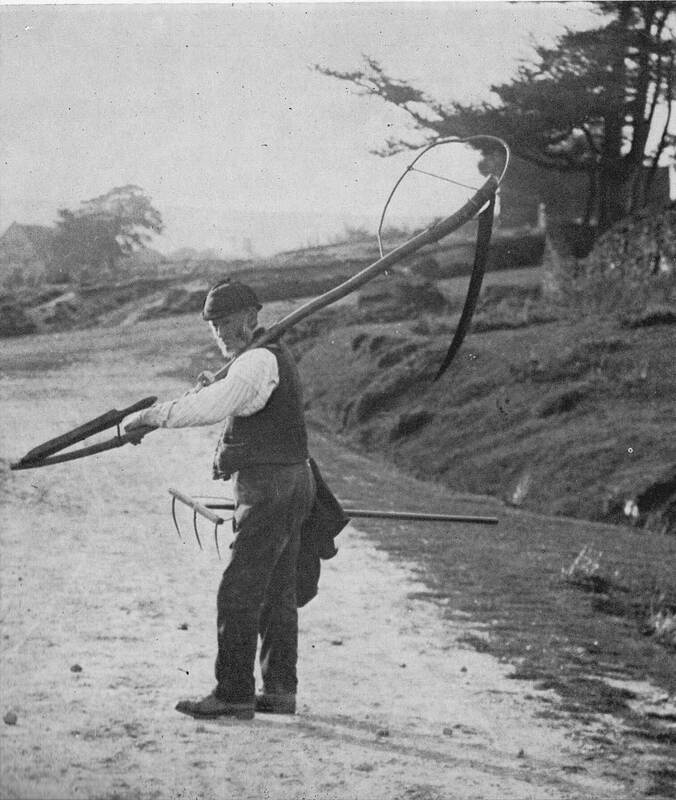 In most old photographs of reed cutting or reaping corn the scythesmen have simple improvised bow cradles fitted, made from sticks cut from the hedgerow and bound to the scythe with string. I have been experimenting with different styles of bow cradle over the last few years. A basic bow cradle works well in stiff Norfolk reed, especially if fitted with a ‘pricker’ (peg). It was not as effective however at John Letts Lammas mow last year – it did not lay the corn neatly so as to make gathering and tying easy. I have looked to develop the design, but still keeping with the bow cradle concept rather than the more elaborate ‘turkey wing’ designs. In a book: ‘Life in the moorlands of North-East Yorkshire’ by Marie Hartley and Joan Ingilby, I came across a neat design that looked worth trying – if only on the basis that if it was a traditional pattern- so it ought to have some merit. In this design the bow is made of thin hazel, willow or a briar with its thorns rubbed off, and is held in place and supported by a thin metal rod called ‘a standard’. The standard is fixed to the scythe using the blade clamp and so is easily fitted or removed as needed. I thought that this could work well with the Austrian scythe if I could find a friendly blacksmith to make one. Fortunately at this years Eastern counties scything weekend Simon Damant invited Andy Window : blacksmith, artist and imaginator who was happy to put the idea into practice. Now my ‘squarehead master’ wheat is approaching harvest I have been able (between showers) to give the new cradle a trial run. I know several people will be experimenting with cradles and corn harvesting so I thought it a good time to share my preliminary observations and stimulate comment and hopefully some practical ideas in return. Whereas with grass you mow outwards, when mowing corn it was common practice to mow inwards with the corn falling against the standing crop As I was working alone I reverted to mowing outward to keep the corn clear of the crop. This was OK – you just have to stoop a bit lower to gather up the sheaves. Mowing corn is easier than mowing grass provided the corn is upright. As the book suggests “scythe according to the wind… never push against the wind”. There is definitely a technique to mowing the corn so it lands neatly arranged to your left – I haven’t put much footage on youtube as I have yet to master this! If the crop leaned toward me at any point the cradle was apt to get snagged. As to the different designs: the Yorkshire pattern having the bow extending forward of the blade did seem to snag more. To improve things I tried to attach a string from the bow to a small ring hooked over the the blade tip (as suggested in David Tresemers scythe book) – this would not stay in place for more than two strokes – and short of drilling a hole I cannot see how it would? My original bow cradle, with extended prickers, worked better but still snagged if the crop was less than upright. At the end of an hours experimentation I had mown corn that could be gathered and stooked without having to re-arrange it (as last year). I think a combination of refinement of technique and design is still needed! “For every three scythes you need three liers-out, three tying up and one to stook”. This entry was posted in Reaping grain and tagged cradle, scythe blade, scything, scything grain. Bookmark the permalink. “…The implement now employed is just the common scythe, universally in use over the kingdom for cutting grass and clover-hay. No change whatever is made in it for cutting heavy or lodged grain-crops; but for light standing crops, a very simple addition is found of advantage. This consists of a small rod or shoot, nearly an inch in diameter, of green willow, or rowan, or broom, or any other flexible and tough young wood. It has its thick end twisted into the small iron rod, which aids in attaching the blade of the scythe to its handle, named provincially the Grass-nail. Its small end passes over the upper side of the blade as far as the back, where it is bent upwards in an easy curve, and is brought backward, and tied with several rounds of strong twine to the handle, about 15 inches above the blade. A piece of strong iron wire is sometimes substituted for the willow rod; but the latter is more approved of, being more easily adjusted to the nature and lay of the crop, according to the judgment of the scythesman. In cutting, the scythesman makes a long sweep, and broad cut forward with his scythe*, (* The sweep of a good scythesman is from 7 to 8 feet, from his right hand to his left, and his cut forward from 12 to 15 inches, in corn standing nearly fair), laying the swathe or cut corn away from the standing corn. The trial has also been made to lay the swathe to the edge of the standing corn, but two inconveniences attend this method; one, that part of the standing corn is irregularly cut by the blade entering it beyond the swathe; the other, that the gatherer, the nature of whose work will be presently described, is liable to be impeded by grasping parts of the uncut corn along with the swathe, and thus experiences considerable hinderance, and much additional fatigue;—yet, as it has the advantage of gathering into the new swathe, by the scythe itself, the straggling ears of the former one, it is sometimes had recourse to on small possessions, where there is not a sufficient number of work-people; but on all the larger farms, which admit of regular bands of scythers, gatherers, binders, and rakers, being so adjusted in number as to give to every one a reasonable share of work, the swathe is always laid away from the standing crop. A person unacquainted with the operation, on seeing the first two or three strokes of the scythesman, at the commencement of a new bout or swathe, would be apt to conclude, that the corn could not be taken up with any regularity, but that a large proportion of the ears would be reversed, as he will see that, immediately on being cut, the ears are inclined away from the swathe towards the scythesman’s right hand. But the judgment that he would form at this time would be quite erroneous; for, on waiting to see the effect of the succeeding sweeps of the scythe on the part of the corn already cut, he will quickly perceive, that, under the hands of a skillful scythesman, whom experience has taught to measure the sweeps of his scytheaccurately, the whole of the ears in the swathe are, step by step, at every succeeding sweep, turned more and more outwards from the standing corn, and at length placed in a position which enables the gatherer to take them up with a sufficient degree of regularity for all practical purposes. It is probably owing to the unavoidable apparent irregularity of the laying of the ears at the first strokes of the scythe, that we have been so late in applying that most powerful and efficient implement for the important purposes of the corn harvest. Every scythesman is attended by a gatherer, and, as the gathering is the part of the work that women can best perform, the gatherers are generally women. 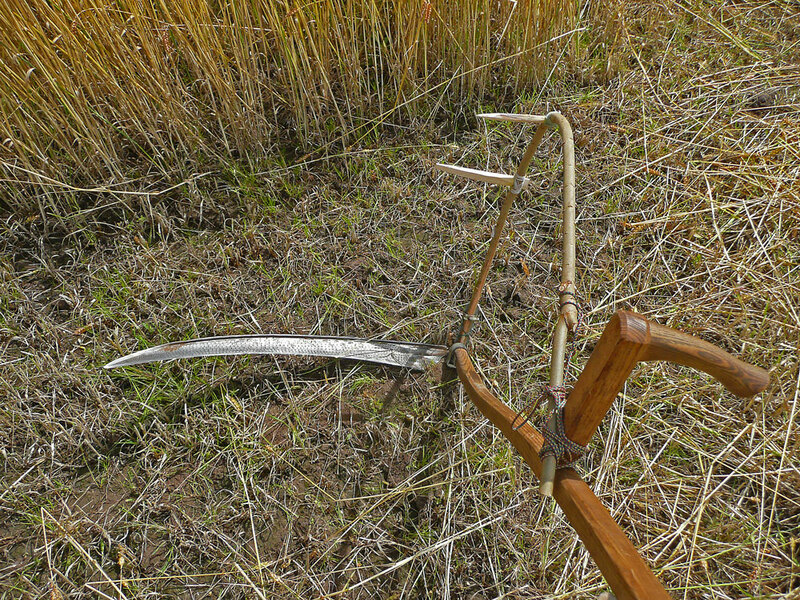 The grain is left by the scythe, having the stems forming an acute angle with the line of the standing corn, the root end of the stems pointing partly backwards and partly inwards towards the uncut part of the field. The gatherer places herself at the root end of the stems, so as to be able to stoop forward nearly in the line in which they are laid, and, by a succession of lifts with her hands, placing the corn on the rear over that which is more forward, stepping at the same time towards the right hand herself, she gathers into one heap what she deems sufficient for a sheaf, and having carefully separated it with her right hand from the forward part of the swathe, then makes a band, in the ordinary way, of a part of the gathered heap, and lays the heap upon it. A binder is also attached to every scythe, who is able to bind up all the sheaves cut by one scythe, and also to set them up in shocks; but there is no novelty in his operations. “ON CUTTING GRAIN-CROPS WITH THE COMMON SCYTHE, AS PRACTISED IN ABERDEENSHIRE”, by the Rev. JamesFarquharson, of Alford. Although the Rev. Farquharson is an advocate of the bow, his article is followed by a rebuttal from the Editor in favour of the rake cradle.